As former director of an art school, Sibylle Omlin knows the art world very well. At the same time, as author and curator, she sees how art and the art business are changing under the influence of digitalization. She advocates maintaining the exchange in analogue formats. In art, how do people acquire knowledge? It’s always good if you can experience things as part of a group. Particularly when you’re learning, it’s important to be able to talk things over with an expert. That’s probably the basic model that would apply in any area of teaching. On the other hand, artists are often powerfully motivated towards learning things for themselves, so 50 to 80 percent of art education is also made up of independent studio or project work. Artists are placed within their own self-determined contexts. They organise things for themselves, then see where that leads and what they can do with it. So artists are largely thrown back on their own resources? Yes, you could put it like that. Even now, we still hold on to the idea of a talent that artists develop from within themselves. But of course, they do this within a particular environment. An artist left all alone in a vacuum won’t achieve anything, which is why an art college or the art scene in general also act as good learning environments; they provide the space where a group that is striving towards a somewhat similar aim can come together. It’s really wonderful to be able to gain knowledge within a group. Later on, artists are then often left to fend for themselves again, even within the higher education context. Nevertheless, we do also increasingly work in teams or studio cooperatives. “Participation” is an important word in the current art scene. Within this framework, we take part in a very wide range of different communal processes, including the processes associated with the generation of knowledge. On the one hand, the image of the artist as a talented individual is still firmly lodged in our minds. At the same time, however, it’s almost impossible for one artist to achieve anything on their own any more. That’s a real contradiction in terms. Yes, and we all recognise that. But the reality for artists is still that they are, in the first instance, alone – even when it comes to marketing. There is an almost complete absence of jobs for artists. You have to create, promote and sell your own projects. In other words, you’re a businessperson. True – although this is a term that still sounds very foreign to the art world. Many artists like the term “Researcher”. These days, art colleges in Switzerland often offer interdisciplinary education and facilitate transdisciplinary interchange. What do you make of that? Before you can work across the different disciplines, you have to have some knowledge. I think the interdisciplinary approach is extremely useful within the framework of advanced education, but I would still argue in favour of a sound basic education within one discipline. But doesn’t the creation of something new depend directly on that contact with other people? Yes sure, as long as this contact takes place on well-prepared terrain. Innovation doesn’t usually simply fall from the sky; it emerges within a context. For example, you might find out through your contacts with other people that you can create a great film with your mobile phone. Of course, everybody can do that these days. That needs to be set against the high standards set by education. But of course, it’s not easy in view of the rapid expansion of knowledge. This means that we need specialists first before any cooperative activity can begin. It’s a balancing act. While we strive towards high quality, we also need to make sure we don’t forget about generalists. I worry that we might hide ourselves away in a specialism and lose our view of the overall breadth, which would also mean losing our perspective of the social and political aspects. This may be a generational problem. That’s why I think it’s important for the different generations to stay in contact with each other, especially when it comes to education. But it also means that young people need to tell us what they expect to get from their education; they must also take some of the tasks involved in their acquisition of education into their own hands. It’s still always a challenge for young people to find their way into society, and into a position where they can help shape events. Artists shape things by their very profession, and it’s something they should do for society too. It’s an important concern for me that we don’t lose this link. Let’s ask ourselves where art education is going. What do you predict? Digital learning is definitely on the way. This is set to become even more important in university education. And that’s where we face the question of how to connect the digital aspect to the social and communicative aspects in such a way that it stops everybody becoming a digital junky in an hour. And what, in turn, does that mean for the role of the artist? This inter-connectivity, this massive space that somehow belongs to us, but is also always somewhere else, emphasises the significance of contact. In art, it remains enormously important. The craft aspect will also continue to be vital, regardless of whether we’re talking about painting or a programming language. Finding a good way to combine the virtual world with the bridge between hand, head and eye is also a challenge for art education. What do artists do to make these virtual challenges comprehensible? Artists are the type of people who enjoy demonstrating things. Most of them are also able to talk very well about what they do. Any works that show these connections create the ideal basis from which to explain them. However, I think that it is best for this engagement to take place in the real environment and in the discussion between the artist and the public. This is why I think it’s important for the art scene to take place in real life, not just digitally. Contact remains the most important factor, and something emerges from it; you take something with you out of these contacts, even if that’s sometimes something extremely small. What have you picked up or experienced recently? Just recently, I’ve been grappling with the abstract painting of one artist. In her paintings, you could only really see a single colour i.e. something that you would actually think you’d recognise from the history of art. But you try describing it! All the same, if you succeed in creating a story that really does put something across, and does it outside a specialist discourse, it is extremely gratifying. And of course, I did also have a special experience: one of the pictures kept to an unusual shade of green, but the paint was applied in highly differentiated ways. I had never experienced anything like that before. It doesn’t sound very spectacular, but if you let yourself be drawn in to this type of picture, a lot will change – the colour itself, the room, the time…. And hidden behind all this are the craft skills of the artist. The craft skills of the artist, exactly. And her experience of what paint can do. But you also need the time and the space. I think that time is one of the most important factors in arriving at new insights; immersing of yourself in something and emerging from it later, somewhat altered. Without time, that’s not possible. 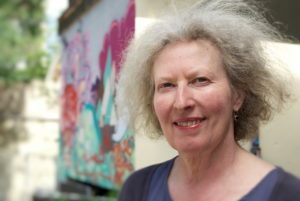 Sibylle Omlin is a member of TRANSIT’s team of experts. She works as an author and freelance curator.